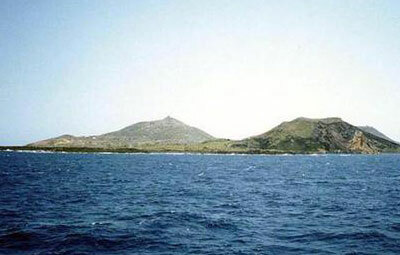 Linosa, the smaller of the two inhabited islands in the Pelagie archipelago, is of volcanic origin. Emerging from the depths of the Strait of Sicily about 800 million years ago, due to crustal thinning that affected the channel from the island of Pantelleria, the island was created through powerful underwater volcanic explosions successively alternated with eruptions of basaltic lava flows, just like those in Hawaii. These alternating processes lasted for several thousand years, from the southeast to the northwest, until eventually the island’s current jagged shape was formed. Linosa is characterised by a series of volcanic cones. Starting from the oldest on the south-eastern side of the island, these are called Mount Vulcano, Mount Bandiera, Mount Nero and Mount Rosso. 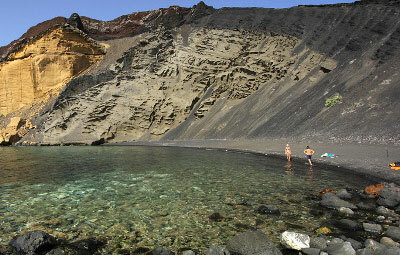 Some of these volcanic cones, like that of Cala Pozzolana in Ponente, have collapsed over time and today the entire inside of the crater is visible; an amazing wall of exposed tuffaceous rocks which, due to the different amount and type of iron content, change colour, ranging between various shades of red and yellow. Lampedusa, was colonised a few years later, in 1847, by Bernardo Sanvisente, together with about 30 people. Today the population has only increased to about 450. From an archaeological point of view, several Roman cisterns, carved into the rock, have been found on the island, which were used for collecting rainwater. Together with a few other remains, this demonstrates that even if the island wasn’t inhabited, it was definitely visited regularly by sailors of the time. Other civilisations have also left traces of their stops here, for example the Phoenicians, Greeks and Arabs (archaeological remains linked to these populations have been found on the seabed in front of the island). Since time memorial, the Linosans have been dedicated to agriculture and rearing livestock for slaughter. Today, lentils and capers are two of their most famous products. From a naturalistic point of view, in addition to the typical Mediterranean scrub, the island is abundant with endemic plant and animal species such as Valantia calva, Limonium algusae, Pancratium angustifolium, Erodium neuradiflorum var. linosae, Valantia muralis var. intricata, Galium murale var. calvescens. Other fauna, which can also be found on the neighbouring islands, include Linaria pseudolaxiflora (also present in Malta), Oglifa lojaconoi (Pantelleria) and Plantago afra subsp. zwierleinii (Pantelleria, Lampedusa and Malta). Linosa is still the ideal habitat for many animal species, for example, the Loggerhead sea turtle, the Scopoli's shearwater (Calonectris diomedea) and the Manx shearwater (Puffinus puffinus), a bird that only comes near land to reproduce.